Only 5 Elite models left in stock! New vehicle pricing includes all offers and incentives. Tax, Title, License, and $699 dealer processing fee not included in vehicle prices shown and must be paid by the purchaser. While great effort is made to ensure the accuracy of the information on this site, errors do occur so please verify information with a customer service rep. This is easily done by calling us at (757) 490-1111 or by visiting us at the dealership. Radio: 540-Watt Premium Audio System w/10 Speakers -inc: subwoofer, 8" display audio w/high-resolution electrostatic touch-screen and customizable feature settings, Bluetooth HandsFreeLink, Bluetooth streaming audio, MP3/auxiliary input jack in center console, Radio Data System (RDS), Speed-Sensitive Volume Compensation (SVC), (3) 2.5-amp USB charging ports, 12-volt power outlets in front console, center console and cargo area, HondaLink, Apple CarPlay integration, Android Auto integration, CabinControl remote compatibility, SMS text message function, SiriusXM radio, HD Radio, mobile hotspot capability (requires AT&T data plan), 2.5-amp USB smartphone/audio interface port in front console, Honda Satellite-Linked Navigation System w/voice recognition and Honda HD digital traffic, 115-volt power outlet, HondaLink subscription services and wireless phone charger SiriusXM services require a subscription after any trial period. Honda HD digital traffic service is only available in the United States, except Alaska. Honda wireless phone charger is compatible with both Qi and Powermat wireless charging standards. Check with your device's manufacturer for wireless capability. 2019 Honda Passport Elite In Lunar Silver Metallic. 6541 E. Virginia Beach Blvd. 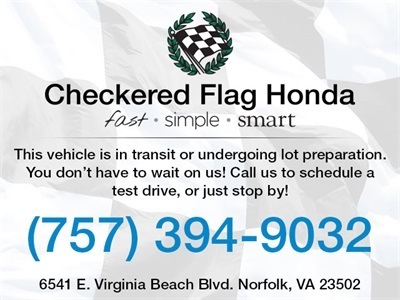 Checkered Flag Honda	36.8540575, -76.1818457.